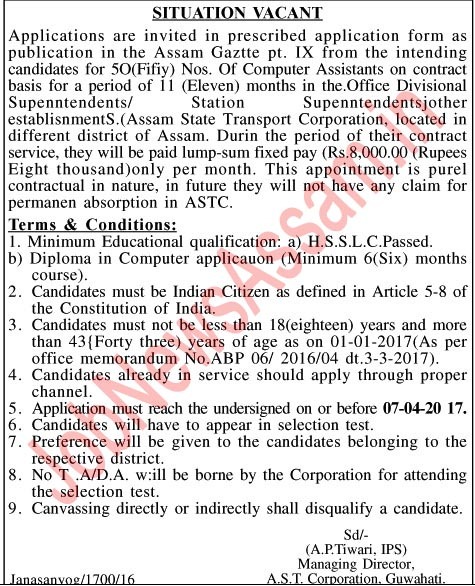 Age limit: Candidates must not be less than 18(eighteen) years and more than 43(Forty three) years of age as on 01-01-2017(As per office memorandum No.ABP 06/ 2016/04 dt.3-3-2017). Fixed pay: Rs.8,000.00 (Rupees Fight thousand)onIy per month. Qualification: Minimum Educational qualification H.S.S.L.C.Passed. Diploma in Computer applicauon (Minimum 6(Six) months course).